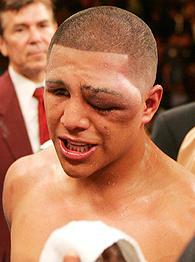 This is what Sugar Shane Mosley's right hand did to Fernando Vargas on Saturday night. The swelling started in the first round and they didn't stop the fight until the 10th. HBO will replay the fight next Saturday night if you enjoy this stuff. it's funny, i don't mind the itching but i just can't stand the swelling.